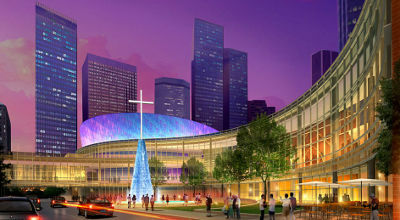 Three years after imploding more than 1 million square feet of building space downtown, First Baptist Church of Dallas, led by nationally known pastor Dr. Robert Jeffress, has completed the largest Protestant church building campaign in modern history, opening its new state-of-the-art $130 million campus on Easter Sunday, March 31. The new facilities feature the newest technological advances for any church, providing a unique worship experience. A new 3,000-seat Worship Center, located next to the historic landmark 122-year-old sanctuary, includes a 150-foot-wide IMAX-quality video wall stretching more than two-thirds the width of the auditorium. It incorporates seven high-definition projectors blended together, making it one of the largest viewing screens in any church in the world. Additionally, wood bands along the walls surrounding the Worship Center contain LED strips that can be programmed to millions of different colors, creating dramatic ambient lighting to supplement and enhance any platform program. Connected to the Worship Center via a glass sky bridge is the five-story Horner Family Center, featuring themed children’s and youth classrooms, a gymnasium, three age-appropriate indoor playgrounds and a seven-story parking garage. A high-impact cross-tower and fountain, which was lit for the first time March 24, are surrounded by three-quarters of an acre of public community space. The fountain serves as the grand entrance to the new campus, featuring a stainless steel cross atop a pedestal rising 68 feet high. Surrounding the tower is a shallow water pool containing a heated baptistery as well as eight water canons and 21 undulating titan water jets. Inscribed along the edge of the fountain’s pool is a Scripture text from John 4:14, stating, “Whoever drinks of the water that I will give him shall never thirst; but the water that I will give him will become in him a well of water springing up to eternal life.” Several custom orchestral scores of anthems and spiritual songs accompany the programmed flow of the cascading water. First Baptist first embarked on the now completed building campaign in 2009, during the worst economic downturn since the Great Depression. Though the popular trend among many churches is to acquire and retrofit unused buildings or open smaller, satellite campuses in the suburbs, First Baptist chose to remain in the heart of Dallas--a place where it has been located since its founding in 1868--in order to continue to serve the residents, business community and guests of Dallas and the surrounding Metroplex. On Nov. 1, 2009, the leadership of First Baptist recommended to its congregation plans to build a new 21st-century campus, unveiling the proposed $130 million project designed to be a re-creation, not a renovation, of the original facilities. Making way for the construction of the new campus required the removal by experts of six original structures, beginning Oct. 30, 2010, using 450 pounds of dynamite and 1,200 charges. Only the original historic sanctuary, completed in 1891, and Criswell Center, built in 2006, remained. The church officially broke ground on the new construction on July 11, 2011. The new First Baptist campus is part of an extensive and impressive ongoing revitalization of downtown Dallas, following the recent opening of several innovative museums, theaters and parks. Jeffress has built on First Baptist’s reputation as a beacon of Bible teaching while aggressively working to improve its future legacy in Dallas. Under his leadership, First Baptist--which was once seen as a dying church--is now experiencing growth and embarking on a new beginning. This year the Easter message of “rebirth” takes on a special dimension for the members of First Baptist Dallas. Do you feel spending $130 million on a church campus glorifies God or could the money be better spent helping people?